When traveling Route 66, mining country continues as you near Webb City and Joplin, where you’ll notice piles of chat and old mine tailings in the area. Webb City, now principally a suburb of Joplin, was once a large corn and wheat farm belonging to a man named John Cornwall Webb. 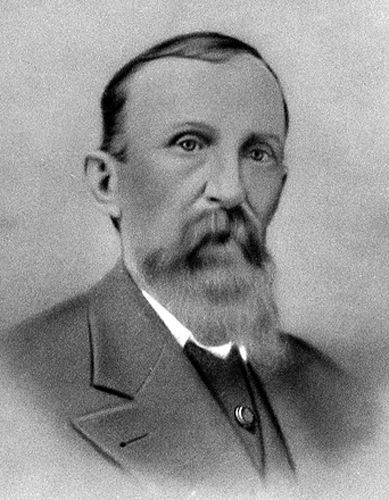 John had come to Missouri from Tennessee in 1856, settling on about 200 acres and subsequently, acquiring an additional 120 acres, part of which would later become the community of Webb City. When Webb discovered lead in his corn field in 1873, he took on a partner named W.A. Daugherty and began to mine. However, the mine continually filled with water and Webb, discouraged, sold his interest and leased his land to Daughterty and another experienced miner named G.P. Ashcroft, two years later. Moving in another direction, Webb platted the town of Webb City, which was also called Webbville, in July, 1875. 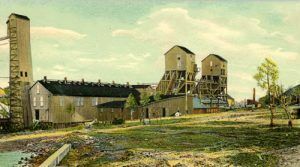 The following year, the Center Creek Mining Company began operations on Webb’s land and the area was soon flooded with miners, most of whom made their homes in nearby Joplin, which, at the time, was filled with gambling halls, saloons, and brothels. In the meantime, the mine owners made their homes in prosperous Webb City and the town was incorporated in December, 1876 with a population of about 700. John Webb’s younger brother, Benjamin C. Webb, became the town mayor. 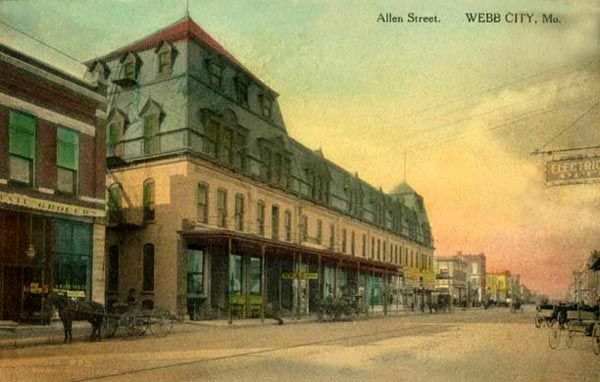 Before long, a business district was born and John Webb was influential in its development, providing land for a school and the first Methodist Episcopal Church; and building the first brick home, brick business building, and the first hotel. More businesses quickly followed, including a hospital. In 1879, the St. Louis and San Francisco Railroad was built to Webb City, followed by the Missouri Pacific Railroad two years later. By 1880, Webb City was called home to nearly 1,600 people. In January, 1882, town founder, John Webb, along with his son, Elijah, established the Webb City Bank. The following year, John Webb died, but his son continued to run the bank, which still exists today. However, like so many other small banks, it was taken over by a larger corporation several years ago. In 1889, a man named A. H. Rogers established a horse-drawn street car line from Carterville to Webb City. 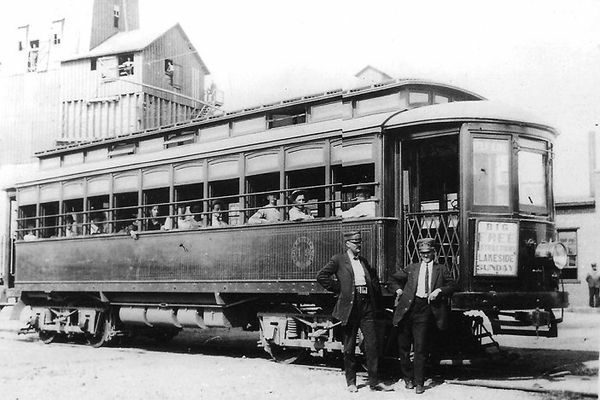 Four years later, in 1893, the horse-drawn street car became the SouthWest Missouri Electric Railway, which operated to Joplin and Cartersville. One of the pioneer interurban railways in the country, the line expanded to Carthage, Missouri and Galena, Kansas in the next few years. After the success of the first sheet ground mine, called the “Yellow Dog,” in the 1890’s, business boomed. By 1896, there were 700 mines located in the in the Webb City-Carterville-Prosperity District, which, produced 23 million dollars in lead and zinc between the years of 1894 and 1904, though they wouldn’t reach their peak until 1918. That same year the co-educational Webb City College was established. In the meantime, Elijah Webb, son of the town’s founder, had continued to operate the bank as well as managing the family’s land and mineral interests, which were leased to numerous operators. Having become very wealthy, he built a magnificent Queen Anne style home during the last decade of the 19th Century that featured two stories, 12-foot ceilings, inlaid wood floors, three fireplaces, oak trim, and all the trimmings of a successful man of the time. It is just one of several historic homes that continue to stand in the city today. Elijah Webb’s beautiful home still stands in Webb City today. Over the next several years, Webb City continued to grow and by the turn of the century, the town was called home to more than 9,000 people. Most of the wooden buildings were replaced with brick, the 100-room Newland Hotel was built, there were 18 churches, an Opera House seating 1,500 people, four banks, two railroad depots, and multiple other business. 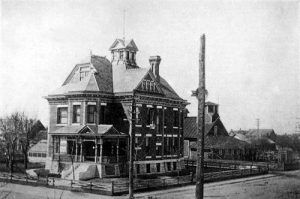 The city soon also boasted a fire department, paved streets, electric lights, water works, a sewer system, and two telephone companies. In 1903 the Southwest Missouri Electric Railway expanded again, building a loop line through Duenweb, and in 1906, north to Alba. It then became known as the Webb City Northern. With Webb City as its hub, numerous buildings were established, including offices, a power house and car barns located on Madison Street between Broadway and Daugherty Streets. In 1910, Southwest Missouri Electric Railway built a Clubhouse for its employees, which was used for passing the time between shifts. It was equipped with showers, beds, card and pool tables. Adjacent to the railroad operations was the site of a large surface mine called the Sucker Flats Mine. Nearby, a second business district developed with several restaurants, retail businesses, and some light industry. Today, the area is known as King Jack Park. A fully restored streetcar continues to operate on special occasions and the depot houses the Webb City Area Chamber of Commerce. The first floor of the power house and the clubhouse are still in use today, the power house being occupied by a skating rink and the Clubhouse, is the headquarters of the Webb City Historical Society. In 1914, the Webb City Public Library was established at the corner of Liberty and First Streets. It continues to operate today and is also home to the Webb City Area Genealogical Society. That same year, World War I broke out and the mines were extremely busy producing minerals for the war effort. During this time, the zinc and lead concentrates produced in the Webb City-Carterville-Prosperity District were valued at more than $18 million and the city’s population increased to some 15,000 people. In the meantime, the the Southwest Missouri Railroad network expanded once again, into Galena and Baxter Springs, Kansas, as well as Picher, Oklahoma in 1917. When complete, the electric railroad line encompassed some 94 miles, serving the Tri-State Mining Field.